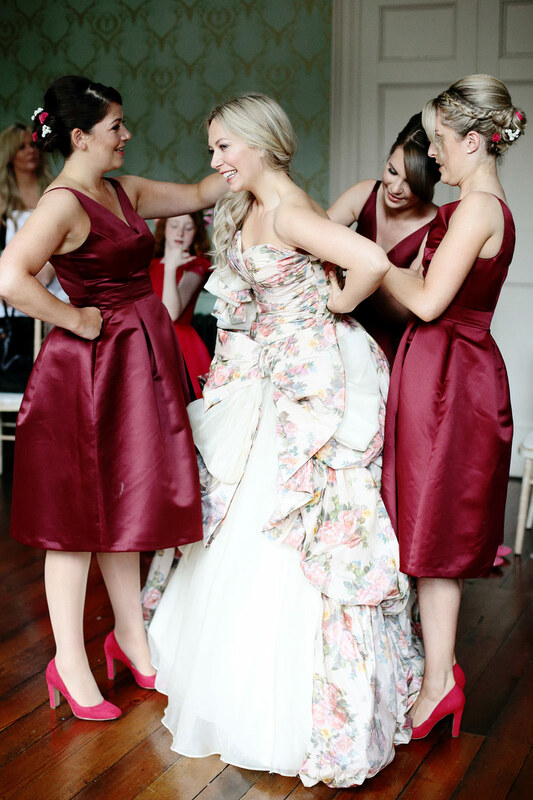 Glamorous Fasque Castle wedding in Aberdeenshire, Scotland. 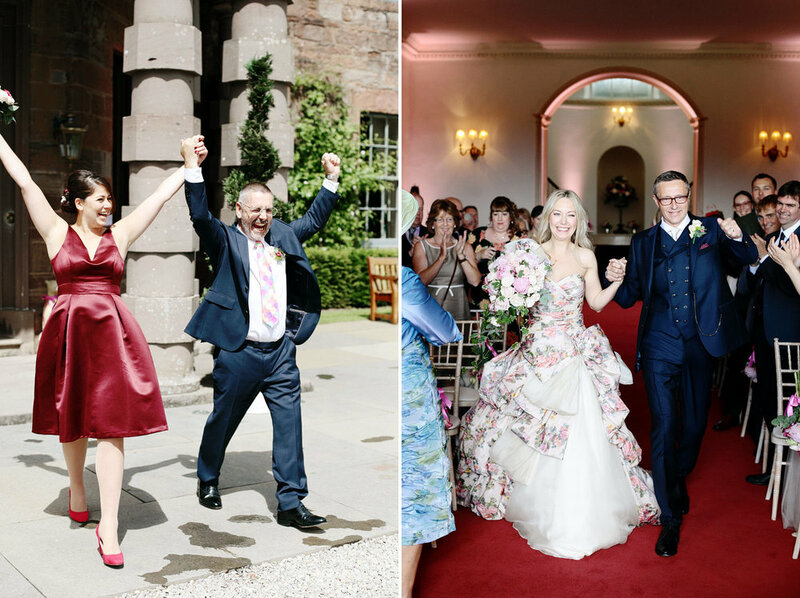 The couple wanted to have a laid-back, but glamorous castle wedding in Scotland, for which Fasque Castle in Aberdeen was a perfect venue. 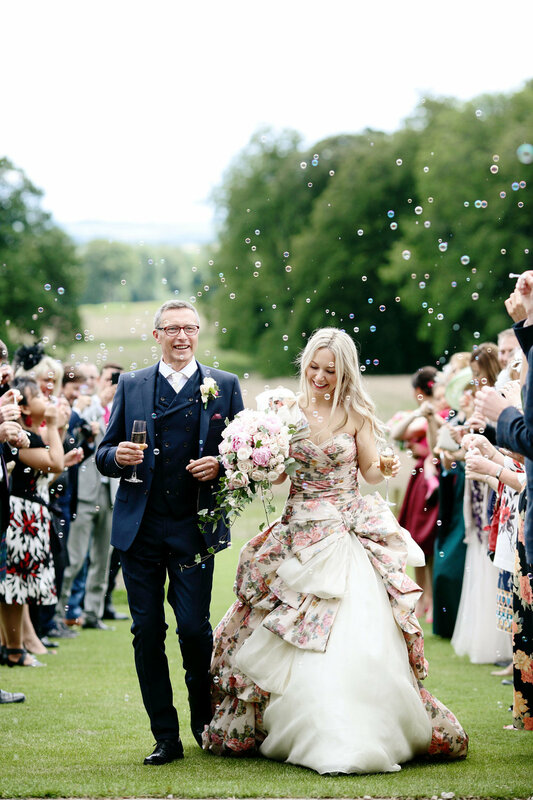 The inspiration for Sarah and Colin's wedding all started with Sarah's unique Ian Stuart floral dress and the wedding invitations she designed herself. 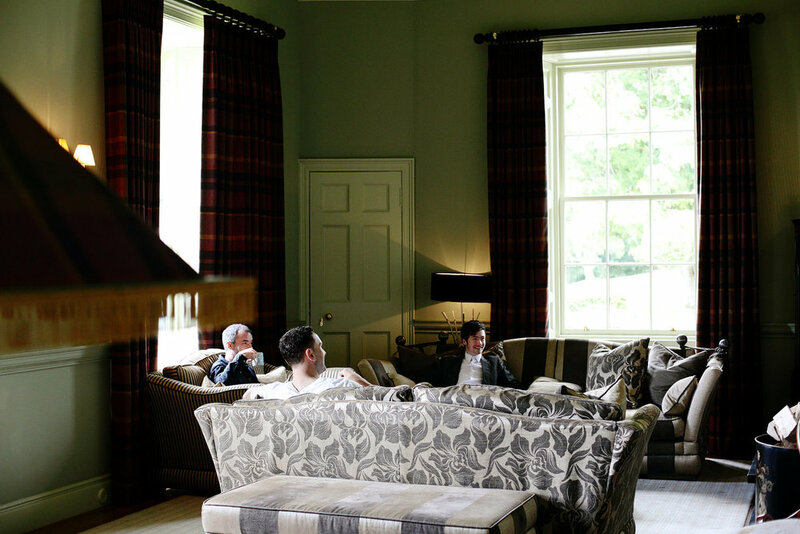 Fasque Castle is one of the top country house wedding venues in Scotland. Surrounded by woodland, deer park and landscaped gardens it is truly magnificent. The wedding morning started with a relaxed breakfast. A lot of the guests stayed at the house, which created a great atmosphere. 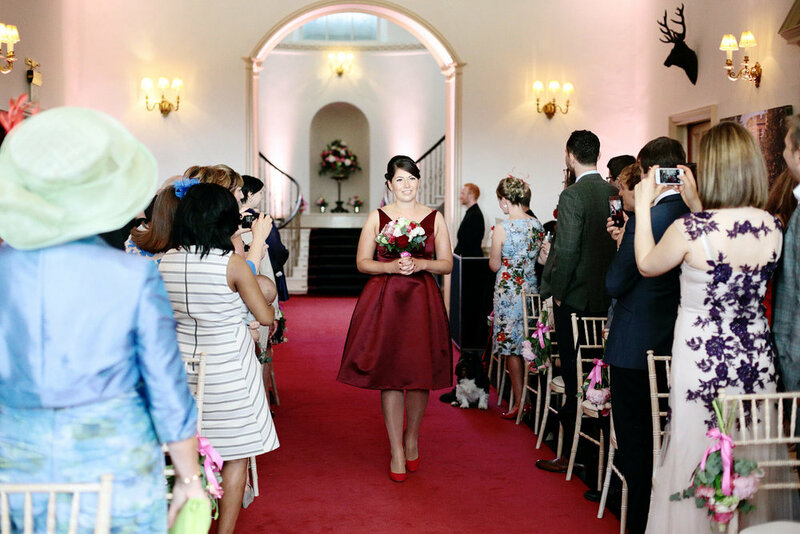 Sarah and Colin opted for a humanist wedding ceremony, which they made very personal to them by writing their own vows (which made everyone rather emotional, including myself!) 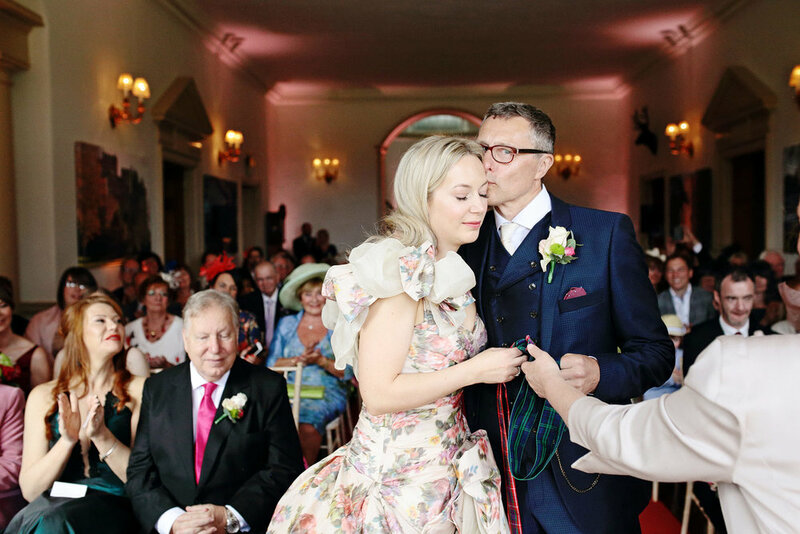 and performing an old Scottish tradition of tying the knot. 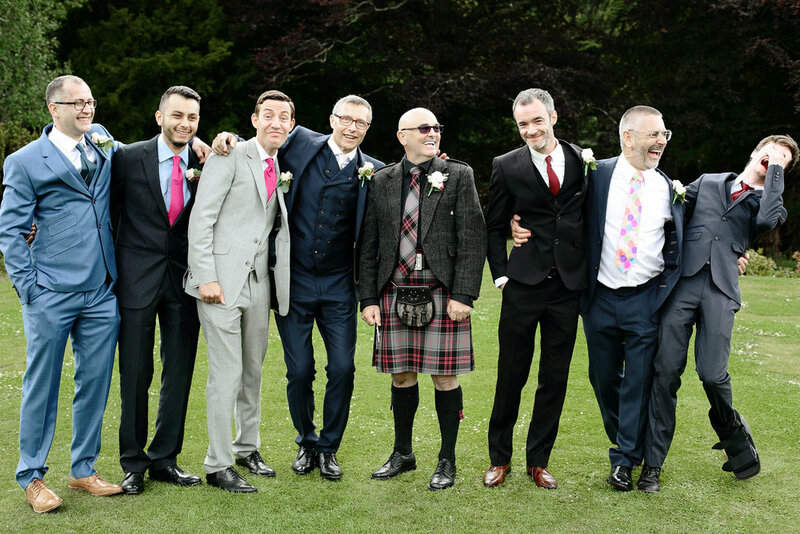 Scottish weather didn't let us down and after the ceremony the bride and groom together with their guests walked out into the beautiful garden basking in glorious sunshine. Champagne and whiskey were served from old barrels, and everyone enjoyed a good old catch-up. 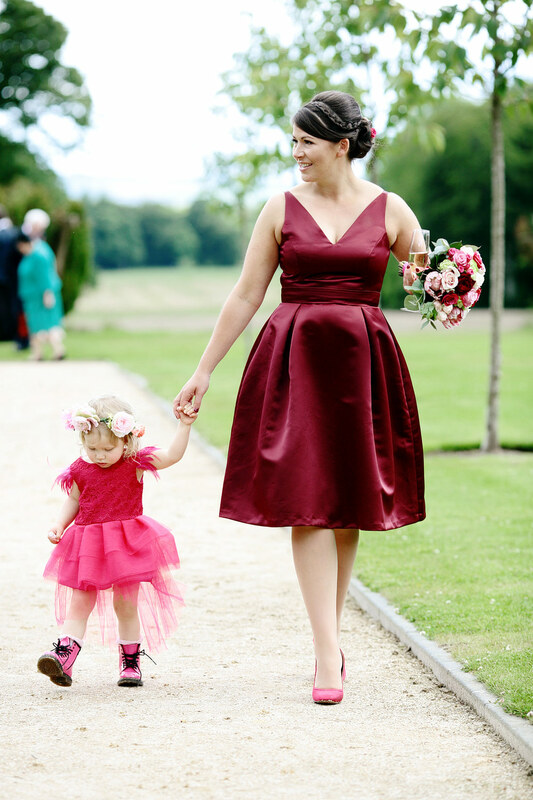 Sarah has been an event organiser for years, and being the founder of supplier and venue directory Chic Scotland, she planned the whole wedding herself. 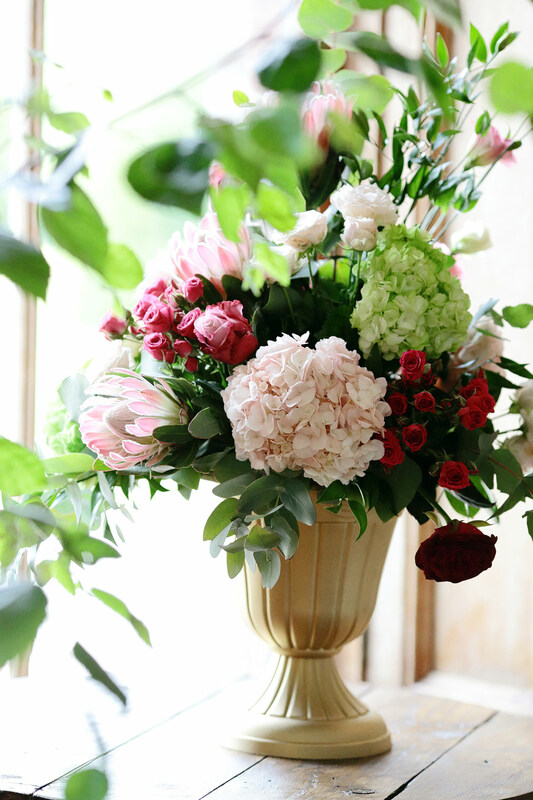 Sarah wanted to bring the history of Fasque into the wedding design, and featured stags throughout the day including one outside the castle decorated with flowers by Isla Duncan. 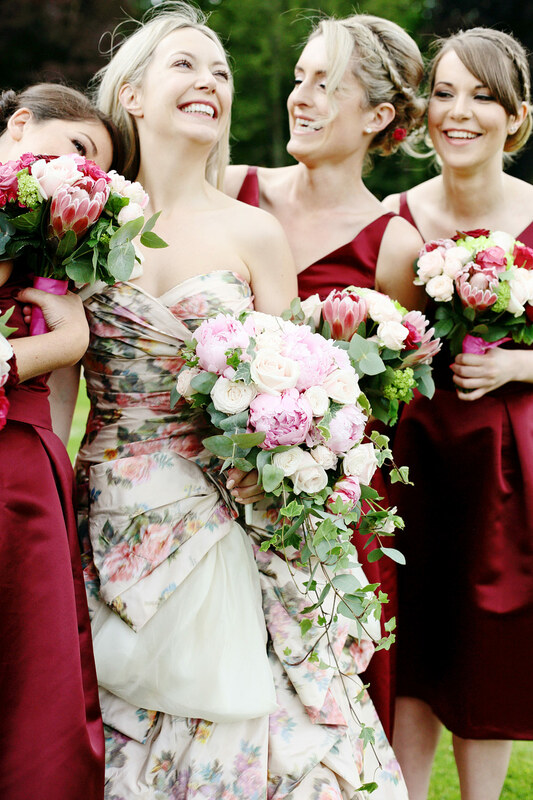 She also wanted to have a festival of colours and used hot pinks, marsala, green and gold colours in wedding decor. 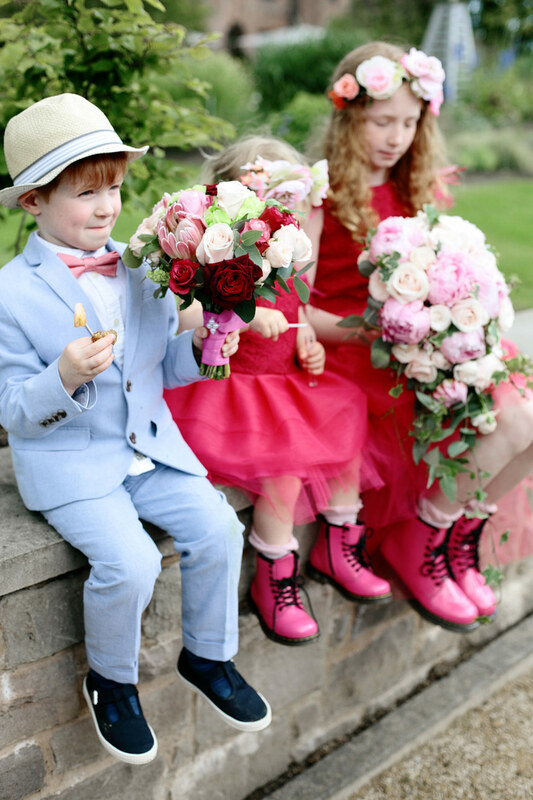 Flower girls were wearing bespoke dresses by Isabelle Randall and hot pink Doctor Martin boots, which they absolutely loved! Evening cocktail bar was a real highlight and a huge hit, with 10 Dollar Shake doing bespoke cocktails in old fashioned champagne goblets. 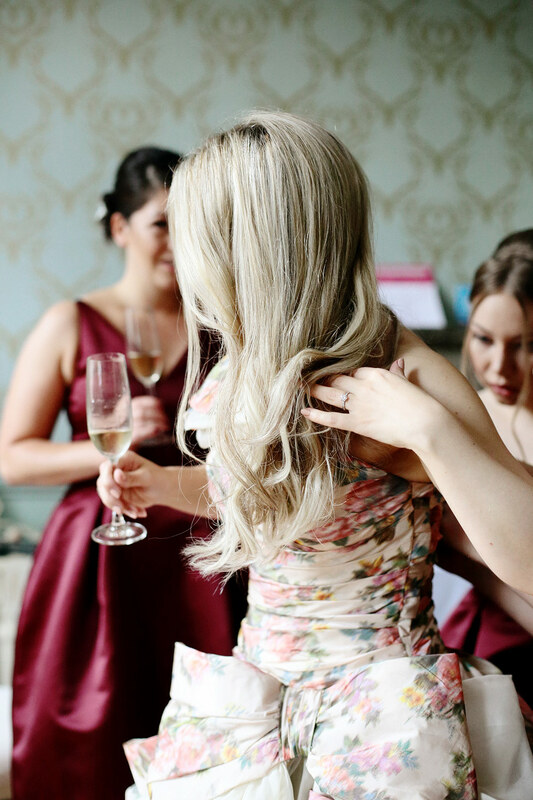 Emma from Timeless White was managing the event on the day to ensure things ran smoothly. 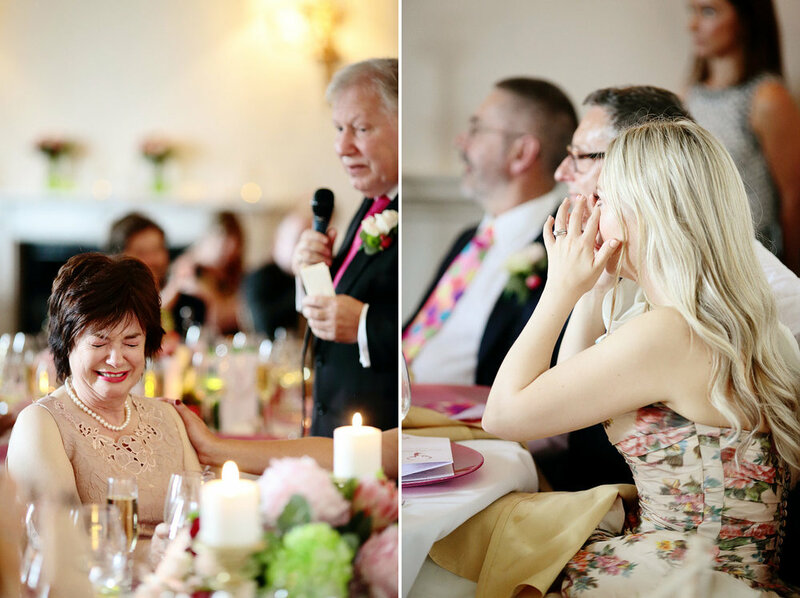 Sarah and Colin's wedding was a dream to photograph with so many emotional and fun moments, personal ceremony and thoughtful details. 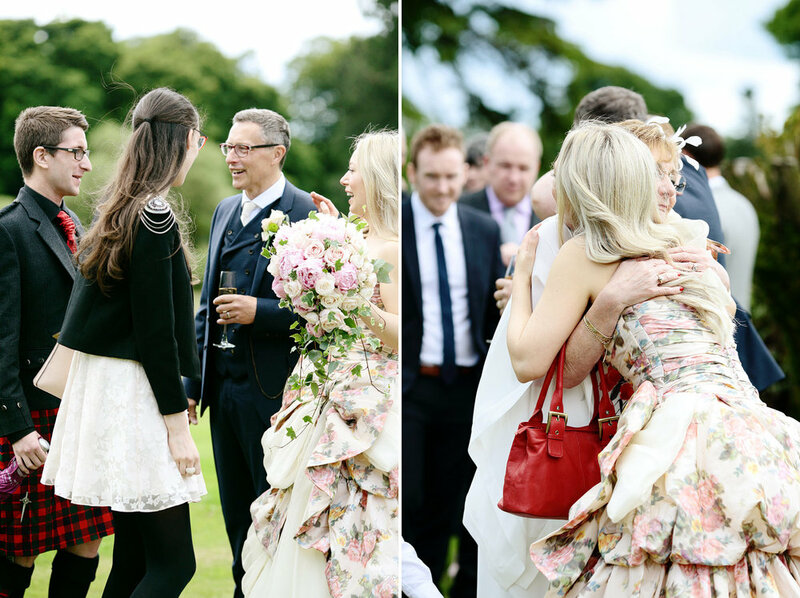 Photo story of Sarah and Colin's Scottish wedding at Fasque Castle.